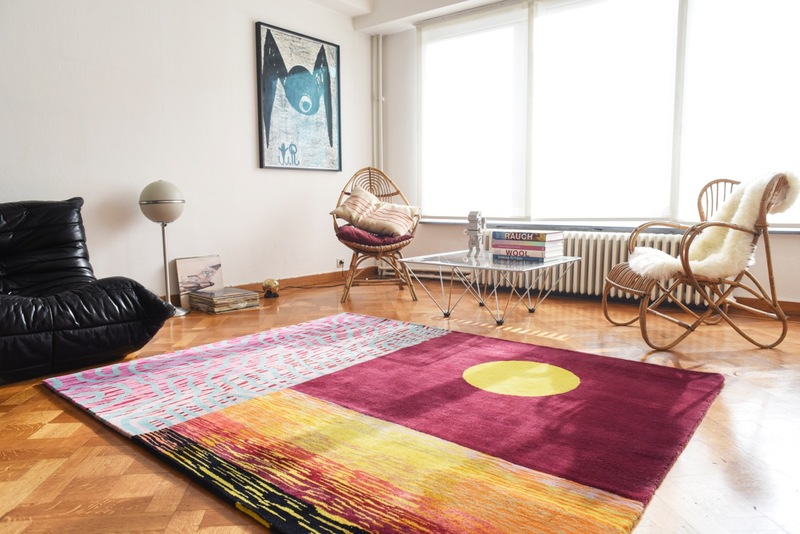 Sam Friedman collaborated with Case Studyo to create a limited editon handwoven rug, called Happy Place based on a painting from 2014. This rug is made of 100% pure wool and was a perfect match to enjoy the warmth and relaxing feeling we felt with Sam’s work. His recognizable artistic language with the use of bright colors, abstract and real life elements generated a landscape we loved – in a large scale – in our home. Put on the wall like a warm painting or on the floor to walk and wonder around in his vibrant landscape. A Happy Place! This 15 colored handwoven and dyed woolen rug sized 200cm. x 160cm. is made to order in an edition of 12 and comes with a signed and numbered certificate.